There's a few products that have become staples in my makeup collection; so I make sure I always have backups ready to use. My favourite foundation is the Mac Studio Fix Fluid, this is medium to full coverage which is perfect for me as I prefer more coverage to even my skin tone, cover redness and just generally make my skin look a lot better than it actually is! 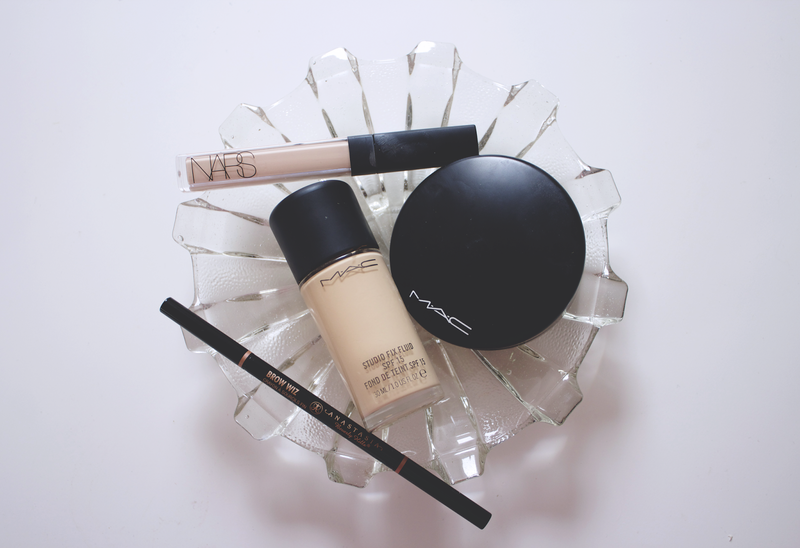 I use the shade NC15, I think Mac are a great brand to try if you struggle with others brand's shade ranges as they cater for cool, warm and neutral skin tones as well as very dark and very pale shades. The Mineralize Skin Finish Natural, also from Mac is something I have used so many times. This is a very light power but is still long lasting and doesn't make skin look cakey or overly powdery. My all time favourite concealer is the Nars Creamy Concealer, it is also a biaaatch to get hold of in my shade; it is constantly out of stock! This means I often buy a few, so that I always have one to use! The problem I usually have with concealer is that they accentuate dry patches on my skin, especially on blemishes and redness. This is a concealer with great coverage however it doesn't dry out or feel overly heavy on the skin! Whenever I order from Cult Beauty, I always add an Anastasia Brow Wiz to my basket! I can't see myself using any other brow product, the product is very fine so it looks very natural. I would recommend any of the Anastasia Beverly Hills brow products as they are all amazing! Hi Georgina! I've just bought Studio Fix for the first time, although I admit I am really loving MAC Pro Longwear at the moment-it's so long lasting-I hope they don't ever discontinue it! I didn't like the NARS concealer so much-I found it was really thick. Having said that I am loving the Urban Decay Naked concealer which is actually really similar, I just find it easier to work with. A definite new fave!